Small Business Saturday began last year and is a grassroots, non-political, non-commercial campaign, which highlights small business success and encourages consumers to ‘shop local’ and support small businesses in their communities. The day itself takes place on the first shopping Saturday in December each year, but the campaign aims to have a lasting impact on small businesses. 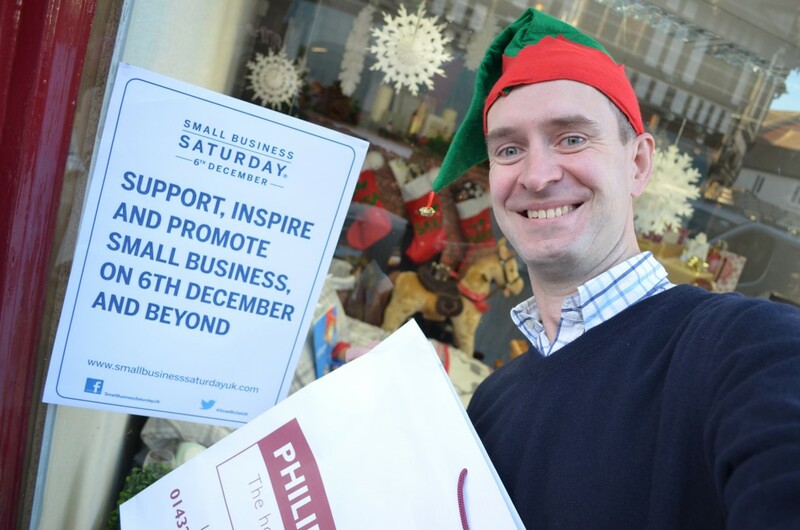 In 2014 Small Business Saturday UK will take place on Saturday December 6th. Philip Morris and Son are fully behind it, especially as recent winners of the Midlands Best Small Family Business Award! Our store’s beautiful town, Hereford, is full of thriving local, independent businesses that completely depend on your support and custom. But Small Business Saturday isn’t just about us; the ongoing support we receive, in turn spreads out to the community. So why should you shop local? For every £1 spent at small local businesses, 63p stays in the local economy. Also, studies show that city centres lucky enough to have unique, thriving independent businesses, boost the prices of nearby houses! Where do you go for a gift donation for your charity event? If you need a venue for a meeting or an event? My guess is to a local business; whether a shop, hairdresser, beauty salon, restaurant or café, we are the first to support events in our community. Nobody knows their stock better than the owners of a store, right? Well, unless the owner has never set foot in the shop because they’re ‘busy’ in the Dubai offices! At local businesses, employees are close knit, and managers are often on hand to give excellent advice about their products and services. Service quality increases tenfold when you walk in to a small business, because they actually care about the business! Get to know us, and we’ll get to know you. Meaning you receive personal, honest service, every time. You go in to the big chains and everything’s the same; same old boring stock. Independent shops and local businesses can offer you unique items that aren’t available anywhere else. Why buy your niece a gift identical to the Argos presents she already has? Get a hand-made toy, personalised art work or a book from a little known author. Get ‘that’ dress from an upcoming designer, and be sure you don’t clash with someone else at the party! hereford, Shop Local, Shop Small, Small Business, Small Business Saturday, Support Your Community. Bookmark.